No matter how spontaneous many of us claim to be, we are humans and thus we are creatures of habits, systems, and expectations. In general, we like our weeks planned and our upcoming changes to be without surprises. This includes—but is not limited to—home renovations such as window replacement projects. I say all of this to ask a very important question: do you know what steps to take when you decide to upgrade your home with replacement windows? All too often, the planning stages halt abruptly after the “budget” stage—but there’s more to replacing windows than determining what you can afford! The team at Brock Doors and Windows is excited to work with you when you are ready to replace those old, outdated, or unsightly windows. We have created this know-how guide so our neighbors in and across Scarborough, ON, are prepped and ready for their next window project! Yes, this is a necessary step, and it should be your first order of business. After all, if you can not afford to replace your windows (or just window, depending on the size of your project), then let’s discuss minor repairs (if needed) which you can afford until the time is right for a full replacement. Meet with a professional while you check out the various window styles so you can ask your questions, discuss pros and cons, and the details of your pending project to get a feel for what will work and what will not. Also, it is very important you meet and feel comfortable with a potential contractor prior to signing any agreement. Depending on the size of the project, this person could literally become part of your daily life for a week or more. If you’re the type to feel 100% comfortable with strangers in your home without your presence, more power to you! For most homeowners, however (and especially for whole-house window installations), it’s unnerving to allow free range and access to an installation crew, unsupervised. Check your work schedule, coordinate dates with other family members or housemates, and make sure to confirm a schedule that works for you. Clean up. You do not want any of your belongings in the way or potentially ruined/made dirty during the installation process. Questions to ask: Will you use drop cloths to protect my interior and exterior belongings? Is there a portion of the process you will definitely need my input/presence? What approximate time each day will you begin and finish? Go ahead, be spontaneous in life! But, take it from us: it is better to plan your Scarborough, ON windows replacement project in systematic steps so you can enjoy your new windows sooner. 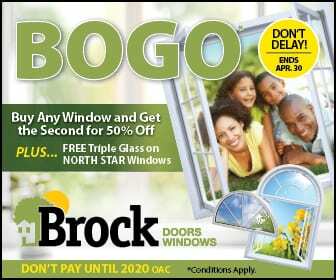 Our team at Brock Doors and Window will see you soon!